“It was the adoption of an unqualified equivalence formulation of conditionality, and related concepts, which led, in my 1962 paper, to the monster of the likelihood axiom,” (Birnbaum 1975, 263). 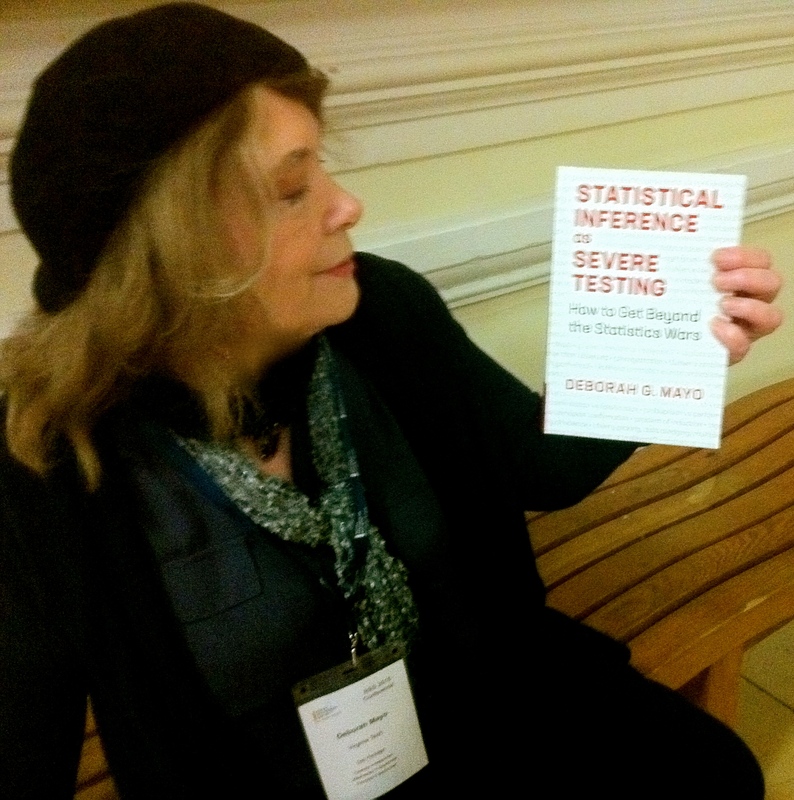 [i] Savage on Birnbaum: “This paper is a landmark in statistics. . . . I, myself, like other Bayesian statisticians, have been convinced of the truth of the likelihood principle for a long time. Its consequences for statistics are very great. . . . [T]his paper is really momentous in the history of statistics. It would be hard to point to even a handful of comparable events. …once the likelihood principle is widely recognized, people will not long stop at that halfway house but will go forward and accept the implications of personalistic probability for statistics” (Savage 1962, 307-308). 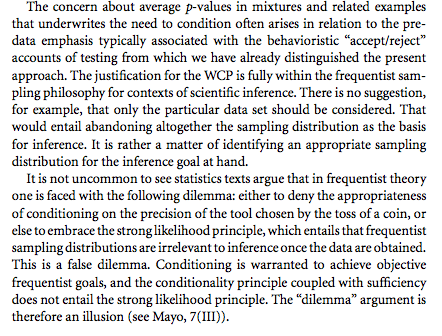 The argument purports to follow from principles frequentist error statisticians accept. [ii] The link includes comments on my paper by Bjornstad, Dawid, Evans, Fraser, Hannig, and Martin and Liu, and my rejoinder. Birnbaum, A. (1962), “On the Foundations of Statistical Inference“, Journal of the American Statistical Association 57(298), 269-306. Savage, L. J., Barnard, G., Cornfield, J., Bross, I, Box, G., Good, I., Lindley, D., Clunies-Ross, C., Pratt, J., Levene, H., Goldman, T., Dempster, A., Kempthorne, O, and Birnbaum, A. (1962). “Discussion on Birnbaum’s On the Foundations of Statistical Inference”, Journal of the American Statistical Association 57(298), 307-326. Birnbaum, A (1970). 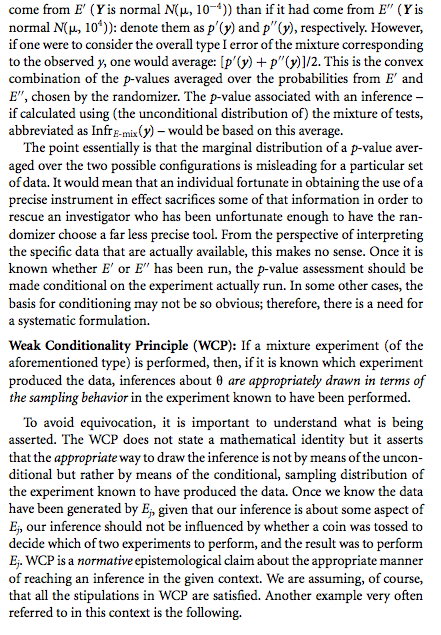 Statistical Methods in Scientific Inference (letter to the editor). Nature 225, 1033. Birnbaum, A (1972), “More on Concepts of Statistical Evidence“, Journal of the American Statistical Association, 67(340), 858-861. Durbin, J. (1970), “On Birnbaum’s Theorem on the Relation Between Sufficiency, Conditionality and Likelihood”, Journal of the American Statistical Association, Vol. 65, No. 329 (Mar., 1970), pp. 395-398. Savage, L. J., (1970), “Comments on a Weakened Principle of Conditionality”, Journal of the American Statistical Association, Vol. 65, No. 329 (Mar., 1970), pp. 399-401. Birnbaum, A. (1970), “On Durbin’s Modified Principle of Conditionality”, Journal of the American Statistical Association, Vol. 65, No. 329 (Mar., 1970), pp. 402-403. Evans, M., Fraser, D.A., and Monette, G., (1986), “On Principles and Arguments to Likelihood.” The Canadian Journal of Statistics 14: 181-199. Kalbfleisch, J. D. (1975), “Sufficiency and Conditionality”, Biometrika, Vol. 62, No. 2 (Aug., 1975), pp. 251-259. Barnard, G. A., (1975), “Comments on Paper by J. D. Kalbfleisch”, Biometrika, Vol. 62, No. 2 (Aug., 1975), pp. 260-261. Barndorff-Nielsen, O. (1975), “Comments on Paper by J. D. Kalbfleisch”, Biometrika, Vol. 62, No. 2 (Aug., 1975), pp. 261-262. Birnbaum, A. (1975), “Comments on Paper by J. D. Kalbfleisch”, Biometrika, Vol. 62, No. 2 (Aug., 1975), pp. 262-264. Kalbfleisch, J. D. (1975), “Reply to Comments”, Biometrika, Vol. 62, No. 2 (Aug., 1975), p. 268. Birnbaum, A. (1975). Comments on Paper by J. D. Kalbfleisch. Biometrika, 62 (2), 262–264. Cox, D. R. (1958), “Some problems connected with statistical inference“, The Annals of Mathematical Statistics, 29, 357-372. Mayo, D. G. (2013) “Presented Version: On the Birnbaum Argument for the Strong Likelihood Principle”, in JSM Proceedings, Section on Bayesian Statistical Science. Alexandria, VA: American Statistical Association: 440-453. Mayo, D. G. (2014). 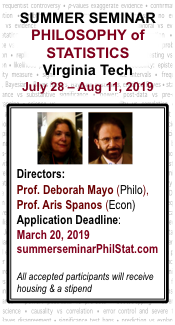 Mayo paper: “On the Birnbaum Argument for the Strong Likelihood Principle,” Paper with discussion and Mayo rejoinder: Statistical Science 29(2) pp. 227-239, 261-266. Reid, N. (1992). Introduction to Fraser (1966) structural probability and a generalization. In Breakthroughs in Statistics (S. Kotz and N. L. Johnson, eds.) 579–586. Springer Series in Statistics. Springer, New York. Savage, L. J. (1962). Discussion on a paper by A. Birnbaum [On the foundations of statistical inference]. Journal of the American Statistical Association, 57, 307– 308. Writers whose earlier editions of stat texts blithely declare that Birnbaum proved the LP should seriously consider changing this in future editions, or in errata. The simple proposed “proofs” are not sound. 1) Neyman-Pearson buff. You must control the type one error in each case. You set the type I error to the same value alpha in each case and your power will vary, being higher in case B than in case A. This of course means that the likelihood ratio for the critical value will change from case to case. 2) Likelihood fan. You must set the critical value of the likelihood ratio to the same value lambda, in each case. If worried about type I error rate, you can choose lambda so that the average value of the type I error rate over the two cases is alpha. Each of these strategies takes account of what is known but they are not the same. Which is right? It seems to me that depending on one’s statistical philosophy one could choose one or the other. Hence saying ‘i must obviously condition’ is only half the story. Yes, you must. Then what? Yes, there are different ways to proceed, and as Lehmann says, there are circumstances where it makes sense to retain the unconditional formulation. If you take Birnbaum’s set-up, as Cox pointed out long ago, it appears you’d have to average over all possible likelihood principle pairs for any outcome. 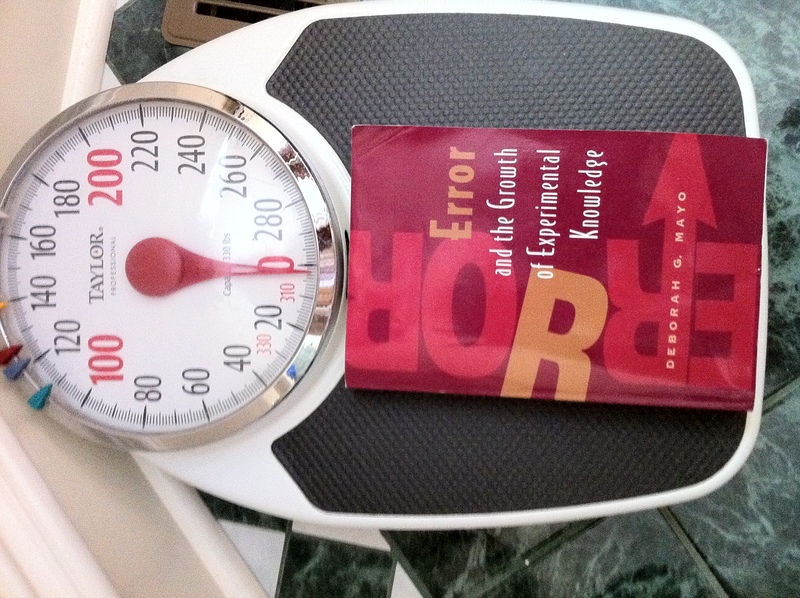 What mainly interests me is that point, and the slippery logical trickery in Birnbaum’s argument that has made it appear that he’s talking about a mixture of 2 weighing machines. It doesn’t go through. OK I must check what Lehman says. Note, however, that I am arguing that either approach is conditional and that neither is marginal. Something is changed conditional on the information. 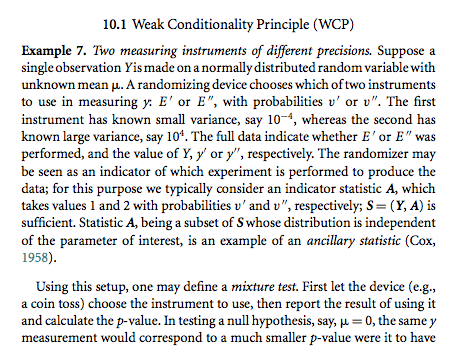 The issue is whether the type I error rate is kept constant and the LR changes or vice versa.